Weekend Getaway- To Take the Kids or Leave Them with Grandma? June 11, 2014 June 11, 2014 Categories UncategorizedFamily Vacation, Trips with Kids, VacationLeave a Comment on Weekend Getaway- To Take the Kids or Leave Them with Grandma? Sorry it’s been awhile since my last post… we’ve been busy to say the least! My stepdaughter came back from Arizona which means my hands are full all day long. She’s at the age where, while she’s helpful in her own way (she can watch my youngest for a 10 minute span while I quick throw clothes on), she also requires a lot of attention. We need to make sure that she knows she still has her own special place in our little family. Anyway….. last weekend we went to a wedding in Wisconsin for my husband’s cousin. It was at a really cute ranch in the middle of nowhere which is actually refreshing (kind of like the fun cabin trips in the summer). After a 4 hour drive stretched to a 5.5 hour drive (because when you’re pregnant, your growing child continues to punch your bladder (and you imagine him maniacally laughing the whole time) and your legs cramp up… super glamorous), we got to our hotel. It was a sight: we stayed at a typical 3-4 star hotel chain but what makes this so special is that it was called “The White House” and had a mini white dome on it. When you went in, there were pictures of presidents all over the walls of the lobby. Each hotel room was named after a state (we stayed in Montana). The reason I’m bringing it up is because that is the full extent of the Presidential analogy the hotel used. I’m so confused as to why they spent so much money on that huge dome when they didn’t continue the “theme” anywhere else?? Well, that’s Wisconsin I guess. 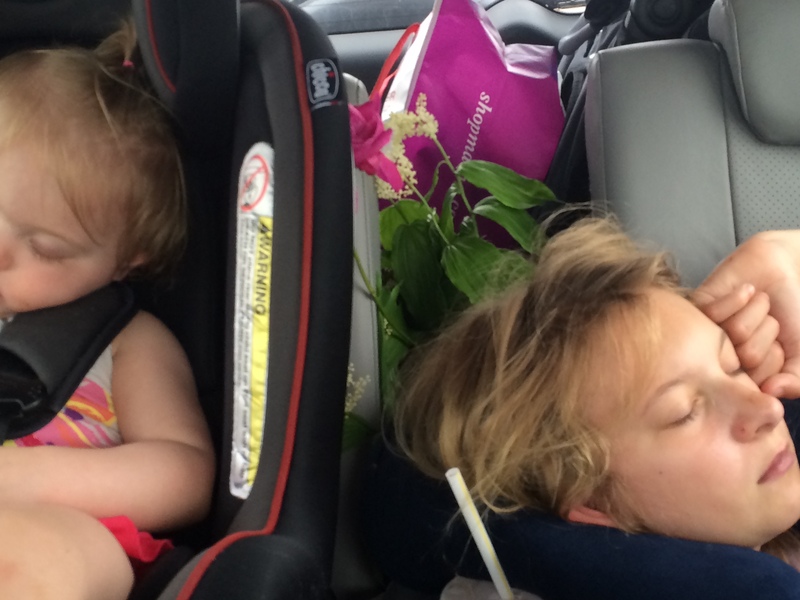 A 5.5 hour drive with an 11 year old and 18 month old was surprisingly easy. They both slept a little, we all ate junk food, and then we got to the hotel and then went to the ranch to see friends and family. That’s when the shitstorm started. Fiona (our 18-month old) decided she didn’t want to sleep because she didn’t want to miss any action. She slept 6 hours that night (the night before the wedding- instead of her usual 11) and only napped for 30 minutes the next day (instead of her normal 2 hours). Going into the wedding, we knew we were in trouble. The ceremony was beautiful and funny too (apparently)– we wouldn’t know. My husband and I w ere desperately trying to keep our toddler busy inside the house while the wedding happened just outside. We missed our 11 year old being the flower-girl and looking absolutely stunning. I have 0 pictures of our family from the event (bad mommy!). Fiona was a tyrant during the entire day and also, on a fun note, wanted nothing to do with me. If I picked her up, she’d scream “DADDY!” and looked at me as though I was torturing her. My poor husband had to chase her around all day because she definitely didn’t want anyone but him. Chris: 1, Stevie’s Ego: 0. That night, we let her cry herself to sleep (which took a full hour) and she slept through the night and morning. She finally woke up and was our normally, happy toddler (right before we left to come back home). Here’s the issue: I’m so happy that we brought her because the 1st and 3rd days she was my happy, beautiful toddler who lit up the room! The 2nd day she was an absolute nightmare. I know the family enjoyed seeing her but I wonder where the “Crazy/Cute Line” is for toddlers (I’m referring to the Crazy/Hot Scale from How I Met Your Mother: a person is allowed to be crazy as long as they are equally hot). Should we have left her with Grandma or was it better to drag her along? I’m not just thinking about us and the rest of the family, I’m thinking about her! She must have been MISERABLE the day of the wedding- she was exhausted but so concerned with missing something that she wouldn’t sleep! I wish this was a question I knew the answer to… for now, we’ll just keep playing it by ear. We’re planning a trip for July 4th with the tyrant… I’ll keep you informed. If you’re someone who prays, please pray for us. 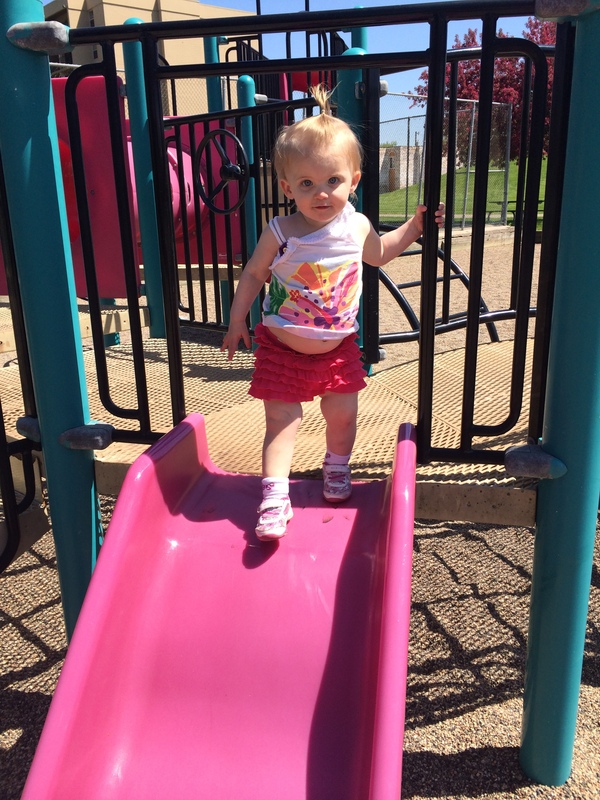 Below is Fiona at the playground on Day 3 when she was my happy girl. She loves her belly and likes to pose like her pregnant, size-of-a-house mommy (belly OUT!). Below is the last picture taken from our trip (I’ve already said I didn’t take pictures at the actual wedding, I took 2 pictures, the two I’ve posted here. Mom of the year right here, folks). They’re both completely passed out on the trip back. I am absolutely going to throw my husband under the bus here and say that he had an epic fail taking this picture…. he barely got Fiona in it at all! At least Alexis looks adorable! P.S. Notice the Hot Mama bag in the background… subtle advertising technique? Perhaps!–PLEASE VISIT THE HOT MAMA ST LOUIS PARK LOCATION (not so subtle, huh?) 🙂 !! !